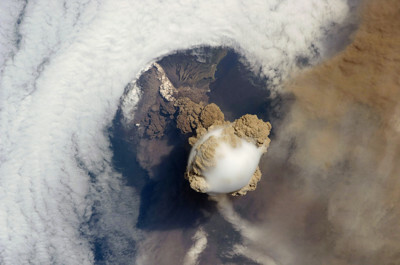 A fortuitous orbit of the International Space Station allowed the astronauts this striking view of Sarychev volcano in an early stage of eruption on June 12, 2009. Sarychev Peak is one of the most active volcanoes in the Kuril Island chain and is located on the northwestern end of Matua Island. Original image given a little extra pop in PS CS4. Incredible view ... love the 3D appearance. Nice work Phil. That is definitely an awesome shot. I love how clear it is and i dont think most people get to see things like this. Exquisite shot and finely processed capture of nature in full swing!! The way the volcano has 'punched' through the clouds and the way the smoke & ashes seem to have risen above the clouds and intermingled all helps to make this image really special. Faved and top marks that fella! This is an amazing photo.You do some fantastic work with these images.Faved and saved.The C-index on this image is appalling. it doesn't have a c-index, i didn't put it through the voting process. Zinedane Zidane - My soccer hero | Have no fear, my gallery is here!